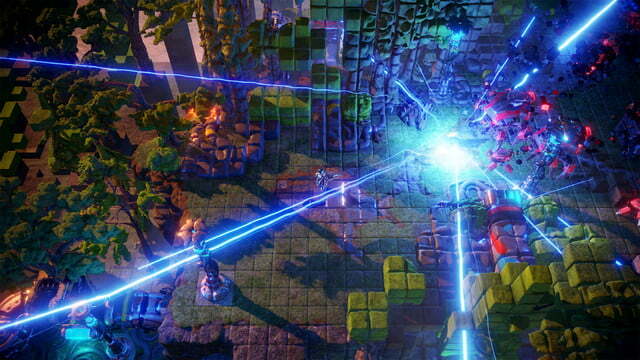 At this point, the name “Housemarque” is synonymous with twin-stick shooters. After making Super Stardust and its many enhanced sequels, the Finnish developer eventually moved its arcade action into role-playing territory with Dead Nation and Alienation that expanded on the genre’s basic pillars, but for old-school shooter addicts. The studio’s latest, Nex Machina, is a triumphant return to the white-knuckled arcade shooter, and together with Robotron 2084 designer Eugene Jarvis, the studio has created one of the best games of the year so far. 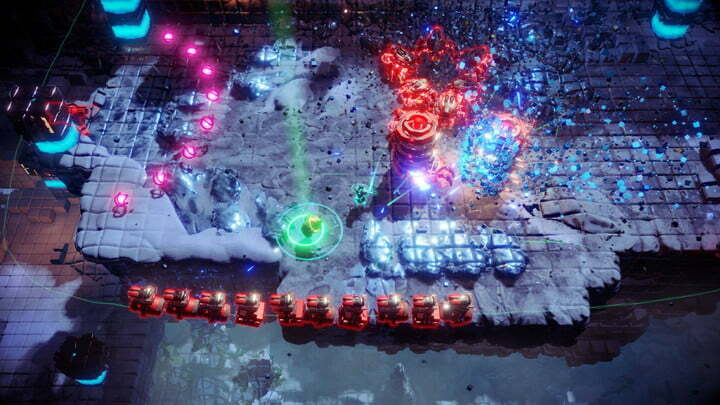 As with any arcade shooter worth its salt, Nex Machina doesn’t have much in the way of story. Artificial intelligence has surpassed that of humanity, and machine lifeforms have risen up in an attempt to wipe out their former masters. Your mission: Destroy each and every one of them while rescuing the humans who haven’t yet noticed the chaos because they’re too focused on their phones. That’s right, in Nex Machina, screen addiction has resulted in the near-destruction of humanity. 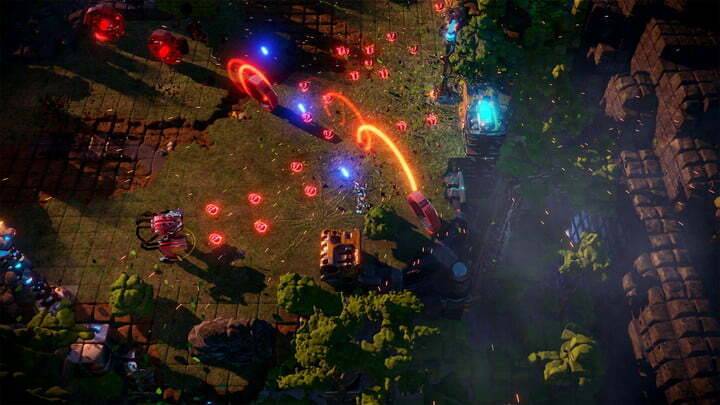 From the get-go, Nex Machina demands your undivided attention. Upon actually starting Nex Machina’s main arcade mode, you’re shown a brief loading screen and get dropped right into the action. Each of the game’s six playable worlds are broken into 15 small levels, which are filled with waves of enemies as well as the humans you need to rescue for a higher score. All of the game’s controls are mapped to just two buttons and the analog sticks. At your disposal is a blaster, which fires automatically and you direct with the right analog stick, as well as a dash. You can pick up special items like rocket launchers, lasers, and even a sword at certain points. 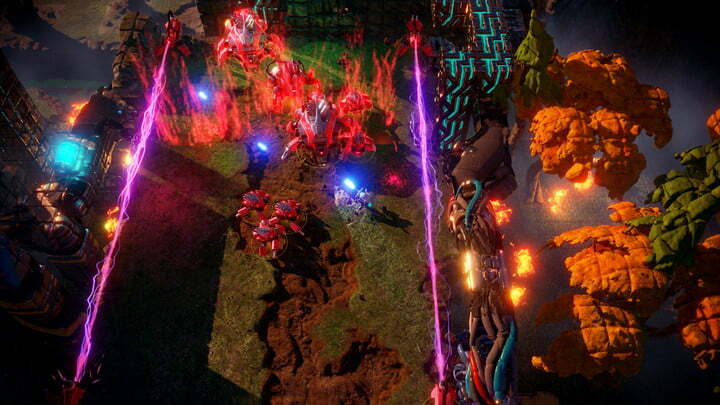 It sounds simple, but it’s more than enough to take on Nex Machina’s legions of murderous machines. As you move between from level to level, smaller enemies will attempt to corner you, while larger, more resilient ones blast away with their ranged weapons. Learning the rhythm of each battle and when to “carve” a hole through machines so you can displace is crucial, and Nex Machina has a habit of always pushing you just a little further than you thought you needed to go. Picking up on an enemy’s pattern and exploiting it in a subsequent run eventually turns the game into something of a dance, with your character essentially on auto-pilot until you come across the next challenge. Even when you’ve hit a brick wall and don’t feel like you’re making progress, the game’s sublime twin-stick shooting will keep you from exiting to the menu. Enemies are destroyed in a flurry of small particles, and you have complete control over every moment of your character. 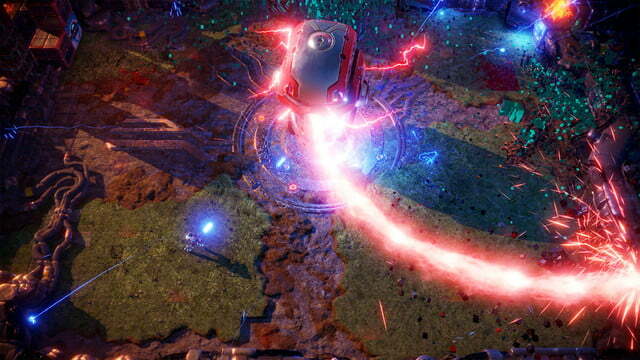 Nex Machina’s toughest moments often come in the form of boss fights, which cap off each world and make for the most frustrating – and rewarding – parts of the game. After blasting your way through waves and waves of machines and, hopefully, picking up some additional power-ups, each boss makes the rest of the world feel like it was being played on an easy mode. Spinning attacks, “bullet hell” moments where it can be tough to even see your character, and death-beams are all on full display, and unless you’ve managed to pick up a shield, one hit is all it takes to kill you. Die just a few times, and you’ll have to restart the entire fight. While it can be infuriating to have this happen when a boss is nearing defeat, learning from your mistakes to make sure you do survive the next time is a feeling that rivals the ending of a Dark Souls or Fire Emblem. Getting stuck on a particular section, while par for the course, can most frustrating because it means you aren’t seeing any more of the beautiful locations Housemarque has created. Filled with breakable walls, secret humans, and even doors to hidden levels, it’s worth exploring their nooks and crannies even if you accidentally die a few times. Each world is built around a different theme, which is reflected in environmental elements like metal, trees, and lava. Some levels also feature extra challenges, which can open up bonuses and affect your approach. 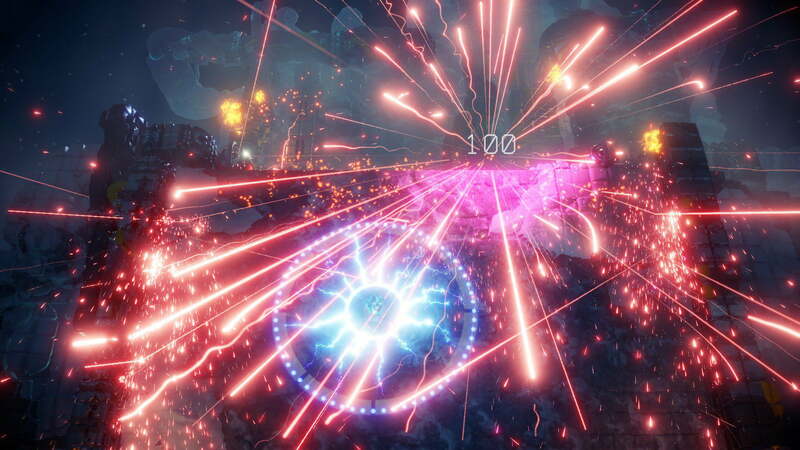 A human surrounded by lava, for example, might seem like an impossible target to reach, but by killing a few enemies, a bridge will materialize in a jumble of beautiful particle effects. Not only can you now save them, but you create a new choke point into which you can funnel enemies. Though taking the time to think this through can lead to a quick death, anticipating and taking advantage of these opportunities becomes second nature. Nex Machina isn’t perfect. A few late-game segments, including the boss fights, could be a little more forgiving on the default difficulty. But at a time when many developers try to reinvent the wheel when it doesn’t need to, Housemarque’s “back to basics” approach is refreshing. Twenty minutes with the game can quickly turn into two hours, and it doesn’t feel like wasted time – every second is a literal blast. Nex Machina is available now on PS4 and PC.